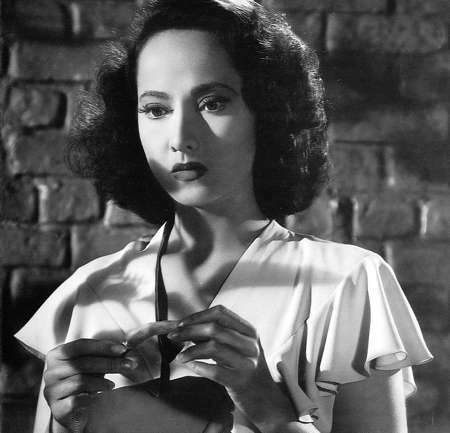 Merle Oberon in Dark Waters. Rarely will you encounter director Andre de Toth's name on lists of the great film directors. He put together an impressive resume in the '40s and '50s, but in retrospect his movies consistently slip back into the middle of the pack. "Routine actioners," says Leslie Halliwell in Filmgoer's Companion. However, De Toth has admirers who respect his gutsy Westerns, such as Man in the Saddle (1951) and Springfield Rifle (1952), and his low-key crime dramas, such as Pitfall (1948) and Crime Wave (1954). His most famous movie is unquestionably House of Wax (1953), filmed in 3D. Thanks to this movie, Hollywood considered him something of an expert on 3-D features--never mind the fact that he only had one eye and couldn't appreciate the 3-D process. Near the beginning of his Hollywood directorial career, he helmed a thriller called Dark Waters (1944)--now available on DVD from Image Entertainment. This movie has a strong pedigree. It features a screenplay by Joan Harrison, who had collaborated with Alfred Hitchcock on Rebecca, Foreign Correspondent, and Suspicion. It features Merle Oberon in the lead role, doing what she did best--looking confused and beleaguered (as she did opposite Laurence Olivier in Wuthering Heights). The great composer Miklos Rozsa (of Double Indemnity and Spellbound fame) wrote the musical score. Archie Stout (who would win an Academy Award for his work on John Ford's The Quiet Man in 1952) served as cinematographer. And the movie includes an impressive list of supporting players, including Franchot Tone, Thomas Mitchell, Elisha Cook, Jr., Rex Ingram, and Fay Bainter. (Both Mitchell and Bainter had previously picked up Academy Awards for their work in Stagecoach and Jezebel, respectively.) In spite of its pedigree, however, Dark Waters is a failure. But it's a fascinating failure. Oberon stars as the recent victim of a sea tragedy. While she was in transit to New Orleans aboard a trading boat, a German submarine torpedoed her ship. Leslie Calvin (Oberon) is one of only four survivors, with her father and mother among the victims. After she is rescued and brought to New Orleans, the "delirious nightmare of the open boat" continues to haunt her and threatens to unhinge her sanity. All of this happens before the curtain rises. In the movie's opening scene, a doctor urges her to write to relatives--with hopes of finding someone to take care of her. Unfortunately, she has never met her only relatives. (Strangely, however, she has their address memorized.) But after writing to her uncle and aunt, they welcome her to visit them at their Belleville, Louisiana plantation--which they have recently inherited. (Conveniently, therefore, no one in the vicinity of Belleville is familiar with Leslie's uncle and aunt). When she shows up in Belleville, no one meets her at the train station. In the humid air, she soon swoons and ends up in the care of Dr. Duncan Rhoades (Franchot Tone). He drives her to see her uncle and aunt and promptly falls in love with her. Meanwhile, nothing at the plantation seems quite right. Leslie's uncle and aunt seem slightly batty. They have abdicated most of the responsibilities for running the plantation to a neatly-dressed dandy named Sidney (Thomas Mitchell) and a weasel-faced overseer named Cleeve (Elisha Cook, Jr.). Soon, Leslie begins hearing voices calling her from the swamp and she fears she is losing her mind. Meanwhile, Cleeve warns her about the swamp: "Only last year a woman went under the quicksand. … It must be awful drowning in quicksand. Much worse than water. Water is cleaner at least--and faster." There's a lot going on in the movie; unfortunately, though, most of the plot is totally irrelevant. That's the big problem with this movie: Joan Harrison's screenplay is needlessly complex. For starters, the first image in the movie is the front page of a newspaper, and the headline screams that a noted oil operator and his wife were lost at sea. Because they were front page news, it's easy to conclude they must have been well-to-do and rich. But no, don't think like that. Just consider the headline as cinematic shorthand. It provides you with a quick burst of background on the oil operator's daughter--Leslie. However, if you deduce this means Leslie is now an heiress, you'll be headed down the wrong road entirely. So, no, once she reaches the plantation, no one is trying to pull the old "gaslight" trick on her--for her money, that is. (And the better you understand this, the better you'll be able to enjoy this movie.) But, what about Leslie's mental state? This is an important part of the plot, isn't it? Well, yes and no. For the first two-thirds of the movie, yes, it is. For the big climatic sequence--which takes place as our hero (Tone) and heroine (Oberon) tread water in the swamp while dodging bullets and hiding among water hyacinths--no, it is not. This sequence is a stunner, but Leslie's mental state becomes an afterthought. Even though the plot is needlessly muddled, Dark Waters is a consistently fascinating thriller. Its parts, however, are more intriguing than its whole. Thomas Mitchell, in the main heavy role, delivers a subtle performance. His menace isn't conveyed through shear bulk or power; it's conveyed through his carefully controlled, modulated speech patterns. He wants to project a gentle, cultivated image, but then we see him egging on Leslie to describe her experiences during the sea tragedy. He knows better. The doctor has already warned him not to ask Leslie about the incident. Meanwhile, Cleeve (Elisha Cook, Jr.) looks at Leslie longingly. He keeps telling her, "I thought we could have some fun, laughs, together." And later, he tells her, "Nights like this weren't made for sleeping." We can tell from the glint in his eyes what he has on his mind. He almost bodily pulls her into a boat before the good doctor intervenes. "Don't touch that," he says as Leslie reaches for the car door handle. "You touch that, the door opens. The door opens, you might get out," he says while sliding toward her across the car's front seat. "If you get out I wouldn't be able to --" And his lips meet hers. The doctor also introduces her to a Cajun family named Boudreaux, who live nearby. In a scene that might be described as lyrical, he takes her to a fais-do-do where partygoers dance to music from a Cajun band. It's a wonderfully appealing sequence; however, during this sequence (which lasts for nearly five minutes), the movie comes to a dead stop. The screenplay fails to integrate this sequence with the movie's brooding, hot-house atmosphere. And that's the movie's chief failure: the screenplay strikes such a discordant melange of plot elements and characters that the movie never comes together. Dark Waters needed someone to streamline the script and give the drama some rhythm. Andre De Toth apparently wasn't that man. He provided the movie with a claustrophobic, steamy environment; however, the movie needed a stronger hand and De Toth let the movie drift lazily until the climatic sequence. At this point, De Toth provides some truly astonishing images as our hero and heroine take flight through the quicksand-ridden swamp. Instead of remaking perfectly good movies such as The Haunting or The Thomas Crown Affair, Hollywood should try ironing out the wrinkles from movies such as Dark Waters. Buried within the confused plotting is a fascinating story waiting to get out. The quality of the print from which Image Entertainment mastered this DVD release was not ideal. The audio is slightly distorted, which has the effect of making Merle Oberon's voice sound shrill. The video quality is good, for the most part. But occasional stretches of the movie look burned out and worn. Dark Waters is now available on DVD from Image Entertainment. Suggested retail price: $24.99.